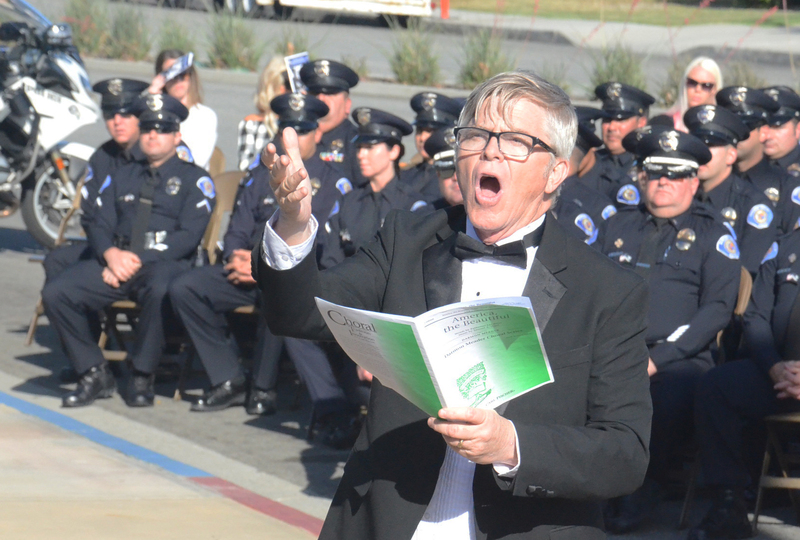 JIM KELTNER conducted the Bolsa Grande High concert choir singing “America the Beautiful” at Thursday’s “Call to Duty” police memorial in Garden Grove (Orange County Journal photos). A former Garden Grove resident who was a first responder to the 2015 terrorist attack in San Bernardino made a plea for understanding of the mental and emotional pressures put on law enforcement officers at Thursday’s 31st annual “Call to Duty” police memorial in Garden Grove. SHAUN SANDOVAL of the San Bernardino Police Department. Sandoval grew up in Garden Grove and worked for the GGPD in a variety of capacities for the agency and was hired as a San Bernardino police officer in 2002. His path led him to being among the first on the scene at the Inland Regional Center, a facility for the developmentally disabled, on Dec. 2, 2015. Two people went on a shooting rampage, killing 14 and injuring 24 others. 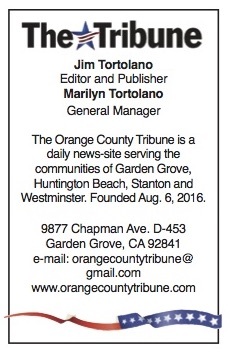 The shooters – identified as Rizwan Farook and Tashfeen Malik – were themselves killed by police in the aftermath. Sandoval recounted his experience in a voice occasionally clouded by emotion. “It was a cop’s worst nightmare,” he recalled. “As bad as the news was, it was worse and personal to me.” He knew many of the people who worked at the center. 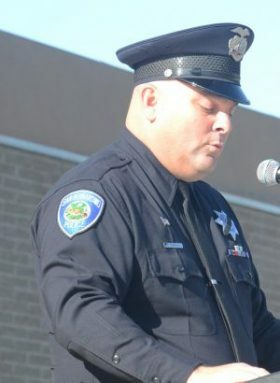 While Sandoval was not fired upon, he experienced the trauma and guilt of having to pass by wounded persons inside the building in order to advance to clear the building of the shooters. He added, “As police officers we prepare for the worst-case scenario and understand the dangers of our job.” But dealing with the psychic pain of encountering tragedy can take its toll. “There has been little discussion on the impacts critical incidents have on officers’ mental and emotional health.” Officers needing help with those issues often won’t seek out assistance because of the stigma and culture that it’s a sign of weakness. Sandoval concluded by asking for a change in law enforcement culture placing a greater emphasis on the inner wellness of police officers. The memorial was full of tradition and emotion. Capt. 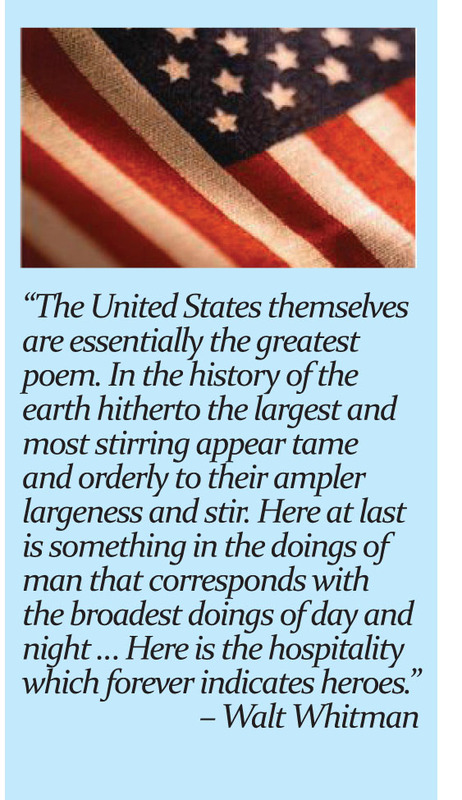 Ed Leiva served as event host, and the program included the Nicholson Pipes and Drums, the “riderless horse” signifying a fallen hero, and the National Anthem sung by Courtney Allison, a GGPD fiscal analyst. Bolsa Grande High’s concert choir sang “America the Beautiful” and “No Man Is An Island.” The most somber moments came when a folded flag and flowers were given to the families of the five GGPD officers killed in the line of duty. 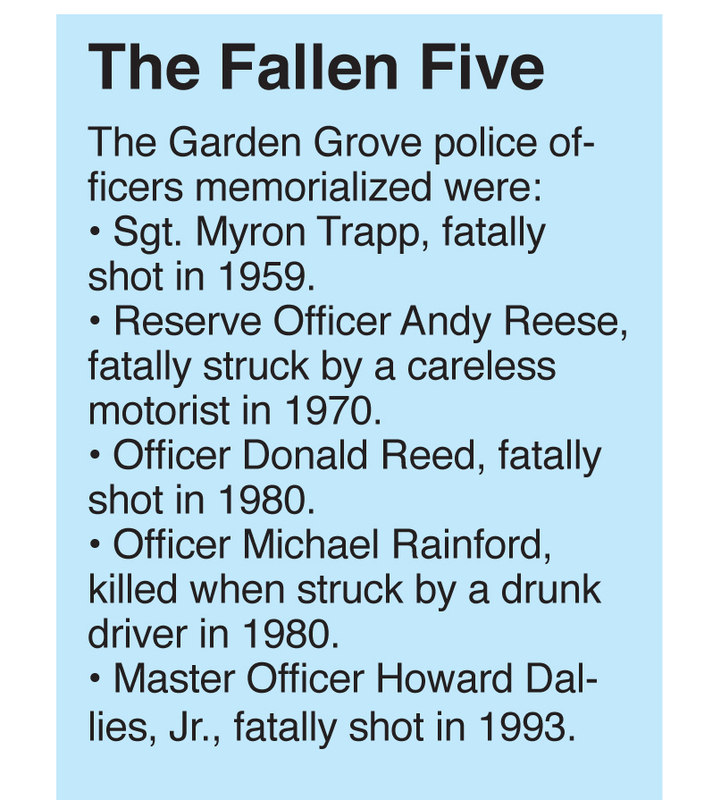 A 21-gun salute, a ringing of the memorial bell and a flyover by helicopter units of the Los Angeles Police Department were also part of the ceremonies held on Acacia Parkway in front of the police facility in the Public Safety Building.